Fears of a deepening non-OPEC supply crunch in response to the latest oil price slump may be overdone as many producers are absorbing short-term losses in the hope of a price rebound, according a new study by research group Wood Mackenzie. Citing up-to-date analysis of production data and cash costs from over 10,000 oil fields, Wood Mac said it believes 3.4 million b/d, or less than 4% of global oil supply, is unprofitable at oil prices below $35/b. Even the majority of US shale and tight oil, which has been under the spotlight due to higher-than-average production costs, only becomes cash negative at Brent prices “well-below” $30/b, according to the study. For many producers, being cash negative is not enough of an incentive to shut down fields as restarting flow can be costly and some are able to store output with a view to selling it when prices recover. “Curtailed budgets have slowed investment, which will reduce future volumes, but there is little evidence of production shut-ins for economic reasons,” Wood Mac’s vice president of investment research Robert Plummer said in a note. “Given the cost of restarting production, many producers will continue to take the loss in the hope of a rebound in prices.” Even since oil prices began sliding in late 2014, there have been relatively few outright field production halts due to low prices, with only around 100,000 b/d shut in globally, according to the study. Despite widespread fears of a major supply collapse, the US’ shale oil output since late 2014, sharp deflation in service sector costs and greater drilling efficiencies have seen shale oil output remain more resilient to lower prices than first thought. Wood Mac said falling production costs in the US over the last year have resulted in only 190,000 b/d being cash negative at a Brent price of $35/b. The history of energy consumption in the US. What’s next? 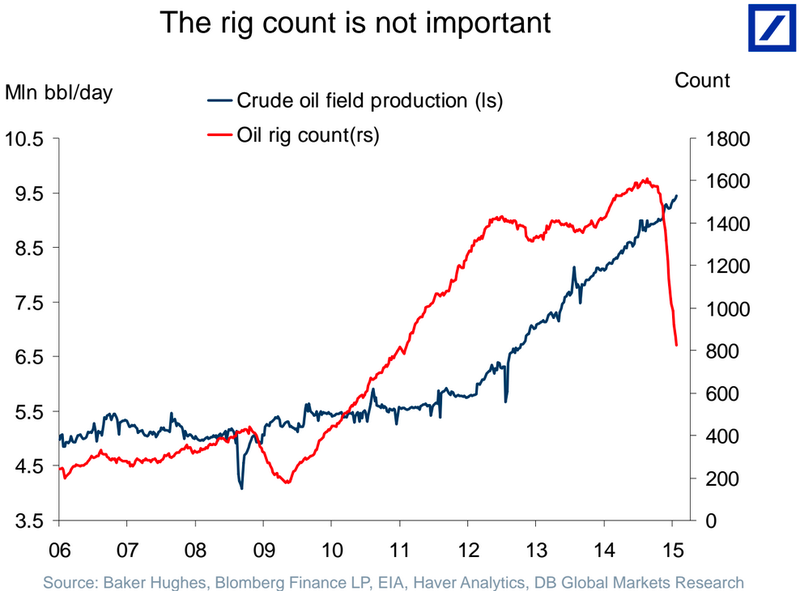 “This chart from Deutsche Bank’s Torsten Sløk shows that to date, the decline in rig count has not put a dent in production as less-efficient wells are taken offline”. 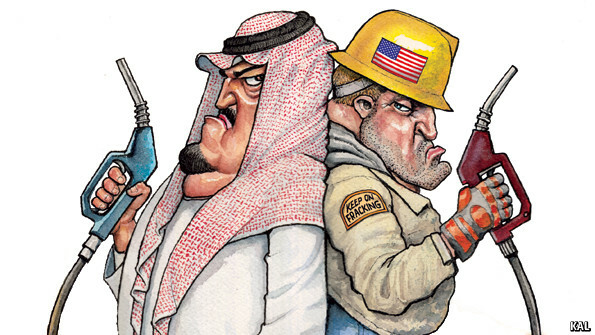 “The obvious place to start when analyzing beneficiaries of cheap oil is the consumer discretionary sector. The “tax cut” from lower prices at the pump is significant. U.S. consumers purchase about 140 billion gallons of gas annually, so a $1.00 drop in gasoline is a net savings of $140 billion (or about 1% of gross domestic product [GDP]). Each household that has been spending about $2,500 per year on gasoline (roughly the national average) will see a drop of perhaps $600 annually, based on U.S. Energy Information Administration (EIA) forecasts. For someone making the median income in the United States (about $52,000), that’s almost an extra week’s paycheck. And the total does not include home heating costs, where additional savings are captured, as the decline came just ahead of the coldest winter months (the sharp drop in natural gas prices is also helping). Depending on your assumptions, savings for the average American from lower energy prices could reasonably be estimated at over $1,000 per year, which for many, is like getting a raise. Keep in mind the consumer represents two-thirds of the U.S. economy.